Over 17,000 people attended Metropole Market’s ‘Alice in Wonderland’-themed event on Sunday 27 May that provided a riveting glimpse into Lewis Carroll’s acclaimed children’s novel, Alice in Wonderland. Thousands from across the county came to Lansdowne on Bank Holiday Weekend for the Bournemouth Metropole Market’s 2018 debut to enjoy a day of family fun. 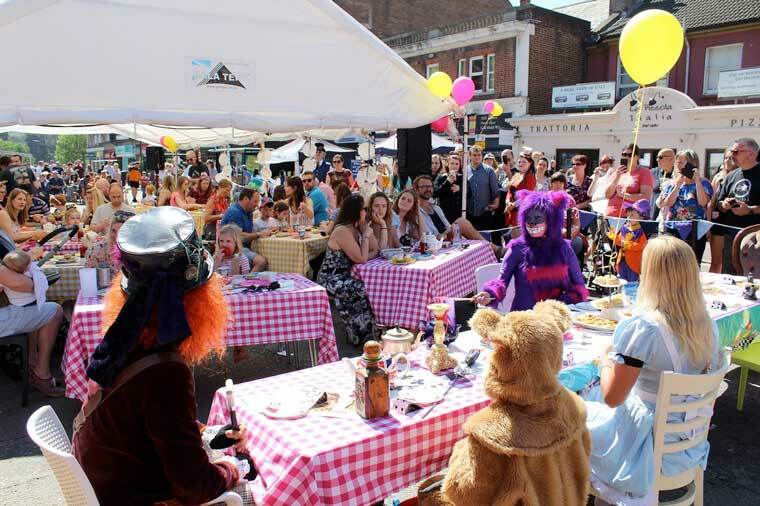 Funded by Bournemouth Town Centre Business Improvement District, the market featured ‘Alice in Wonderland’ inspired outfits, entertainment, a tea party and a Yarn Bomb, which contributed to the event’s authenticity. The entertainment ranged from talented local musicians – including the hugely popular Lewis Jordan Brown Trio – to nationally-renowned stilt walkers, Beetlejuice Circus; crowd favourites, Street Comedy; and local theatrical artists, Pantheatrix. An extensive number of stalls filled Holdenhurst Road, with international food specialities, delicious sweet treats and refreshing drinks. The range of stalls also included arts and crafts, clothing, accessories plus unique and alternative decorations and trinkets. The ‘Alice in Wonderland’-themed celebration enabled market-goers to enjoy Lansdowne’s street party from 11am until sunset. This will be held on 24 June and will feature jamming jazz bands and stirring entertainment, as well as food to reflect famous Louisiana cuisine, in addition to the regular foodie offering. Metropole Market will continue its series of markets on the last Sunday of each month in June, July, September, and October with a break in August.